A critical aspect of highway maintenance in winter is the effective and efficient control of snow and ice. The Maryland Department of Transportation State Highway Administration (MDOT SHA) is keenly aware of its responsibility to provide safety and mobility for motorists on State-maintained roads during winter storms and, at the same time, do so in a cost-effective and environmentally sensitive manner. Several years ago, MDOT SHA embarked on a major effort to reduce road salt usage and intensify environmentally friendly practices during winter operations. A nationally recognized team of winter operations experts performed a “Top-to Bottom” review of MDOT SHA operations. 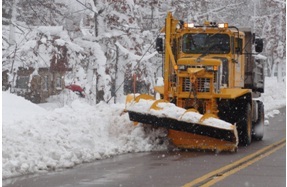 At the team’s recommendation, MDOT SHA adopted Opportunities for Improvement (OFI’s) such as increased proactive anti-icing (spraying salt brine on highways before the onset of frozen precipitation), close monitoring of salt application rates used by MDOT SHA and contract operators, and increased personnel training in “sensible salting” operations. As MDOT SHA continues to implement the OFIs, it’s seeing positive impacts. Anti-icing is now performed on most interstates and major corridors, increasing safety for more motorists across the State. Our maintenance shops track the salt usage of every snow plow operator, allowing MDOT SHA managers to identify plow operators who are getting the job done with lower amounts of salt. MDOT SHA empowers these “champions” to mentor others in sensible salting practices. MDOT SHA continues to test and deploy new materials, equipment and strategies. MDOT SHA expanded the use of salt brine that will increase anti-icing effectiveness, lessen salt usage and increase motorist safety. MDOT SHA deployed snow fighting trucks fitted with larger front plows, side “wing” plows, and, in some cases, trailer-mounted tow plows. The equipment increases plowing effectiveness, resulting in a further reduction of salt application. Continuing deployment of an Automatic Vehicle Location (AVL) system will improve communications with plow trucks and allow better coordination of our resources. MDOT SHA is continuing an initiative to expand the coverage and reliability of its Road Weather Information System (RWIS) sensor sites. These mini-weather stations provide up-to-date weather and road information to managers, allowing them to make timely and appropriate plowing and salting decisions. MDOT SHA has learned how best practices improve safety, reduce cost and improve the environment. Many of these best practices form the basis for the Statewide Salt Management Plan, created by MDOT SHA in conjunction with the Maryland Department of the Environment. The plan is one of the many ways that MDOT SHA helps other State, county and municipal highway agencies fight winter storms.